As part of our content marketing services, LaunchUX writes, optimizes and maintains blogs for some of our clients. We primarily write them for regional companies in specialized, highly competitive fields where enhancing SEO rankings and establishing expertise are equally important. And blogs are great to achieve both. At LaunchUX, we understand that you may have been burned by a bad blog experience in the past. Perhaps you tried to start your own industry-shaking, game-changing blog, and – like your monthly e-mail newsletter – it fizzled out after a few posts. Honestly, you weren’t really sure if your blog was having any effect at all. Without realistic goals and expectations, writing a blog can feel like you’re just sending your most brilliant ideas into the abyss. Unlike your newsletter, however, the remnant of your blog-to-be remains permanently affixed to your site unpopulated, unvisited with digital tumbleweed tumbling by (or Tumblring if you launched your blog on Tumblr) – a living testament of your inability to follow through on long-term commitments. When interviewing clients, we have been shocked to discover that some of them had been so embarrassed by their attempts at blogging that they secretly hoped nobody visited it. For that matter, what is “good” when we’re talking about blogging? Do you even want a blog? To answer these questions, we need to understand how blogs fit into the larger digital marketing toolbox. Businesses, customers and Google all want the same thing: Secure, fast-loading web pages that deliver quality, regularly-updated content whether it is accessed on a computer, a smartphone or a tablet that is connected to an active social media presence. LaunchUX offers web design and social media solutions that fulfill everything in the above sentence, and blogs specifically fulfill the “quality, regularly updated content” portion. Here is how blogs fulfill these criteria and why your business should trust us with your blog. Google rewards sites that provide visitors with quality, regularly-updated content, and a professional blog is a great way for your company to fulfill this requirement – if it’s done correctly. It is unreasonable and unwise for a company to make substantial changes to its website on a monthly basis. Even at the most rudimentary startup levels, your company really shouldn’t be changing its core offerings, messaging and contact information from week-to-week. 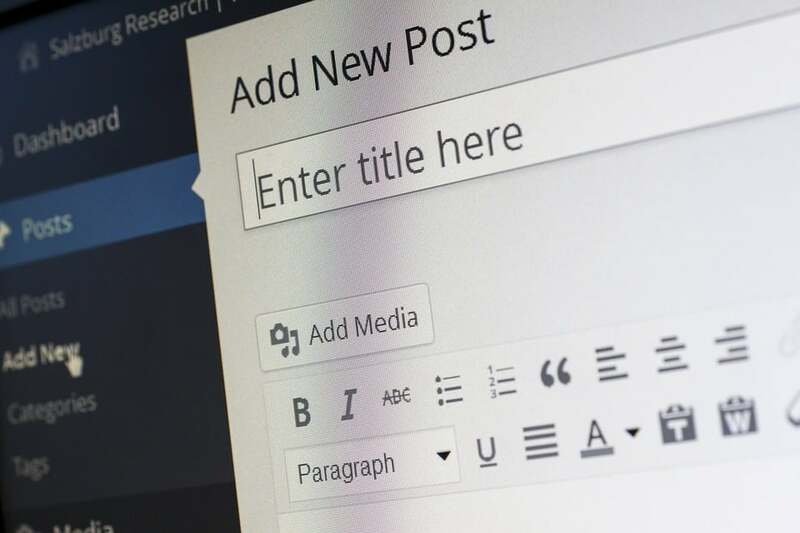 Blogs integrate directly with your main site and allow you to post fresh content on a regular basis so Google knows that your site is active and engaging – exactly the kind of site they want to send their users to. Blogs naturally enhance your keyword vocabulary. Even if your company only offers a single service (which is unlikely), your customers will be searching for it from a wide variety of vantage points. It widens the mouth of your sales funnel. For example, blogs can enable a solopreneur who makes ikebana flower arrangements to attract customers who are seeking gift ideas for Mother’s Day and interior designers seeking the perfect piece to complete a hotel restaurant. For website copywriting, this is a seven-ten split of marketing. For a blogger, it’s two well-crafted posts. Each new blog entry is a new source of keywords – and a new source of customers. Blogs contribute additional metadata to your overall web presence. This part gets a little more technical, but from a search engine standpoint, metadata is very important in helping to determine which pages are given priority. Metadata is essentially information about the webs page that helps the search engine to better understand how likely your page is to address the searcher’s needs. Metadata can include titles, slugs, photo descriptions and more. Generally speaking, the more you include, the better. It goes without saying that search engine optimization is very important. Your customers are searching for you online, but – if they find you – what are the finding? This is where “quality” comes in. A well-managed blog is a salesperson who works for you twenty-four hours a day, seven days a week – even on holidays. There is a good chance that your blog will be a potential customer’s first encounter with your company. The foundations of interest and trust begin here. Blogs are a valuable form of Content Marketing. The key is to always remember that your company’s blog is part of a larger digital marketing strategy. Yes, your blog can be less formal than your other marketing materials. But remember that casual Friday means business casual Friday. The content being posted on your blog can have a conversational tone, but it still has to support your larger brand message. If your sales team couldn’t show it to a customer in the field, you probably shouldn’t post it. You know your business. Perhaps you’ve studied for years on top of an apprenticeship to gain your knowledge. Your knowledge has value to your customers. But you can’t convey five years of practical learning in a five-minute customer meeting. Blogs allow you to begin that education process long before the initial in-person contact is made. Once the customer is convinced, your blog will guide them to the website for more information or directly to the contact form. Of course, it works the other way, too. If you encounter a prospect while you are out in the field, you can guide them to your blog to explore the depths of your expertise on their own time. The primary goal of your website is to inform potential customers of your products and services. While it needs to be interesting and engaging, the real emphasis is on clarity and user experience. Your blog is an opportunity to go beyond what can be contained on the main portion of your website. As with expertise, if you try to cram all of your passion into your initial meeting, you risk intimidating a potential customer. A blog is your passion in manageable portions. Blogs are often thought of as being “above and beyond” the main website, so some extra effort here can go a long way in demonstrating your commitment to your field. Blogs can be anything you want – as long as it’s good. A blog can take on a number of forms. In fact, depending on the company’s needs, sometimes the “blog” is actually a “news” section or a “press” section. Some blogs are full of DIY tips while others function as newsletters designed to keep customers and employees up-to-date on the company’s activities. Some blogs are written as letters from the company to the customer. Some are written as white papers addressing larger industry concerns. Some provide helpful tips and ways to save money. Some announce recent employee accomplishments and certifications. They can appear is easily-scannable numbered lists or long-form essays. It all depends on the company, the audience and the subject. The common theme is that blogs all establish your expertise and passion while boosting your overall search engine optimization. Growing trust and building relationships takes time. While blogs are known to go viral, they’re not as flashy as their social media counterparts (although social media and content strategies pair quite nicely). As we discussed previously on the blog, once something is on the internet, it is pretty much there forever. However, blogs and social media posts are consumed in fundamentally different ways – yet they still have to connect to form a coherent strategy. Social media is generally thought of in terms of “trending” posts. Social media is what is happening now. When we see things that we like on social media, we react to them and share them now. Blogs aren’t as flashy, but they dig deeper so they’re good all year long. Unless your company undergoes a significant restructuring, your blogs could potentially be shareable for years. And topical blogs shared on social media can be a very effective combo. Search engine optimization is never a one-and-done deal. Successful SEO requires a content factory capable of producing engaging, optimized copy month after month. Each post casts a wider and wider net (expanding your keyword vocabulary), but it also keeps your website on Google’s radar. It’s a marathon – not a race. As we mentioned at the beginning of this blog, many companies try to do too much out of the gate. They burn out after a few brilliant posts, and then the blog sputters and you start seeing multi-month gaps with each new post beginning with the classic apology: “Sorry I haven’t been posting on here as much as I should.” And ending with the dubious promise: “Stay tuned because I’m going to be writing on here a lot more.” Blogs require patience and discipline. Theoretically, if you started a blog as a startup and stuck with it, it would tell the complete story of your company. Slow down. These things take time. Like social media, blogs are one of the areas where our personal and professional lives overlap. The connection is personal, but the tone still needs to be professional. Accordingly, the thought of handing your company’s blog over to a stranger to maintain can be scary. But it’s really not. Even when we’re doing the work, you are always in control. Here’s how it works. We start with an intake interview. The process begins with a comprehensive interview that will provide us with a thorough understanding of your company, your industry, your strengths, your weaknesses, your existing branding and messaging, and your competition. We will also discuss your previous experiences with content marketing and any other marketing strategies you might be using. Then we do our research. We take the findings from the interview and couple it with additional research to identify key topics and issues affecting your industry. This information will form the core of the blog writing process. Then we write a draft. We’ll figure out which formats are best for your company (see “Blogs can be anything you want” above), and we’ll compose a draft for your review. We’ll e-mail you a document for your review. At this stage, the document might not be copyedited, but we’re more interested in getting the tone and messaging correct. Not only is the information correct, but does it sound like you. Would you be comfortable showing this to a potential client? You respond with suggestions and edits. We incorporate those edits, and we study them to fully immerse ourselves in your brand. If the changes were substantial, we might send them back for another round of edits. This step might be more beneficial in the early stages of the relationship to build everyone’s confidence, but the need for a second revision should fade out fairly quickly. Once the changes have been incorporated, we move to optimization and publication. Finally, we lay it out, optimize it and publish it. After the blog copy has been approved, we take care of the rest. Keywords, imagery, headings, captions, metadata – we do it all. If you have contracted LaunchUX for your social media needs, we’ll take care of distributing it on social media as well. Blogging is a long-term strategy, and we look forward to growing your business and growing with your business. In some cases we have been blogging for clients for well over a year (in one case several years! ), and after that amount of time, our values are pretty much in step. We do our best to not be intrusive, but the more contact we have with the client, the better the blogs tend to be. For some clients, that’s a monthly in-person visit. For other clients, it’s a quarterly check-in call. In order to effectively convey your expertise and your passion, sometimes we need to talk to your passionate experts. For most situations, talking to managers and heads of marketing is sufficient, but sometimes we need to go a little further into the company to tell the whole story. Blogs can be edited after they are published. Blogs aren’t chiseled into stone, so if you catch something after it’s “live,” we can make changes on the fly. We can handle the imagery, but often the businesses have already taken the best photos of themselves. Whenever imagery can be provided – or we are able to take our own photos – the results are better than stock photos. But stock photos have come along way in recent years, and well-curated stock pictures are better than no There’s probably a stock photo on this blog entry, and it’s not so bad, is it? You get out of blogging what you put into it. Even if we’re doing the heavy-lifting, the blogs benefit from quick feedback turn-around times and easily-scheduled interviews. We do our best to work around your schedule – morning or night – but we can’t publish something if you haven’t signed off on it. If you are a passionate expert in your field, then a blog is an ideal way to express those qualities. If you are a passionate expert in your field who is too busy running your business to start (or continue) a blog, then let LaunchUX write, optimize and maintain it for you. Your website is a great way to introduce your products and services to customers, but a blog lets you explore those subjects in greater detail. Contact us today to learn more about how a LaunchUX-powered blog can enhance your digital presence.